Jan and Cora Gordon would stay with Ashley and Doris Smith at their cottage in Itchenor (Sussex) during the later years of WW1. The Cottage was No. 9 and Ashley rented it from 1914 onwards. "It had dining room, kitchen, larder, 3 bedrooms, a very prolific garden and a large brick wood shed at the end of it." He made some modifications: "I dug out the cobbles in front of it – made a fence and a portico with two seats over the door and then I planted honeysuckle and a climbing rose tree. Cottagers from around came to look. To praise? Oh no, but “Why can’t these Londoners leave things alone etc.” Now the roses have spread to the cottages on both sides and there’d be blue murder if that rose tree was dug up and destroyed." The climbing roses can still be seen today, a hundred years later. In August 1917 Jan and Cora Gordon visited the cottage: "We did all sorts of things during the first fortnight – mushrooming – walks – swims – water boating etc. and Jo spent quite a long time making rough sketches of the infant. Jan very happy and fit." A painting by Jan Gordon of this area is shown below. A blue boat is pulled up on the shore. 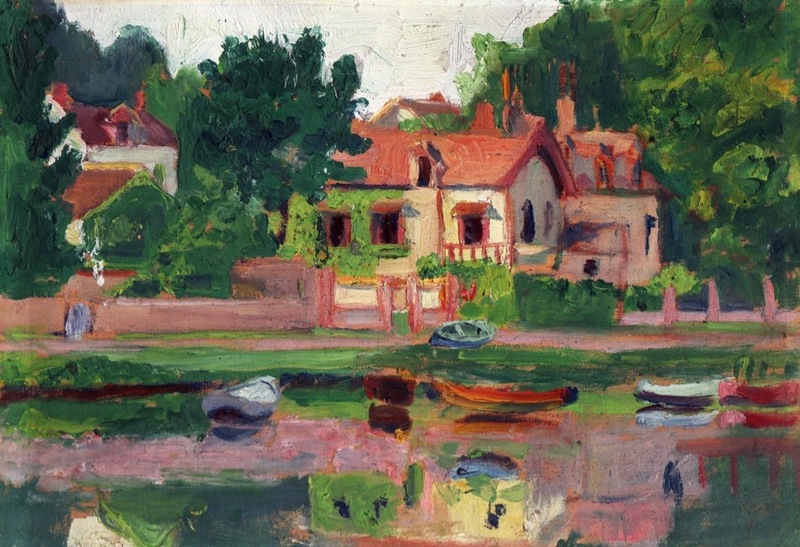 Blue, orange and green boats are reflected in the calm water, as are the white-walled, orange-roofed houses and trees in several shades of green. Painting of a West Sussex scene ca 1917, by Jan Gordon on wooden board, 20 x 14 cm. Ashley's description of the end of the Gordons' visit that August was as follows: "Had an exciting time seeing the Gordons off – took them to Bosham in Marguerite with the waterman – the latter wouldn’t go so Doris and Jan rowed all the way and the Gordons just caught their train by the skin of their teeth."